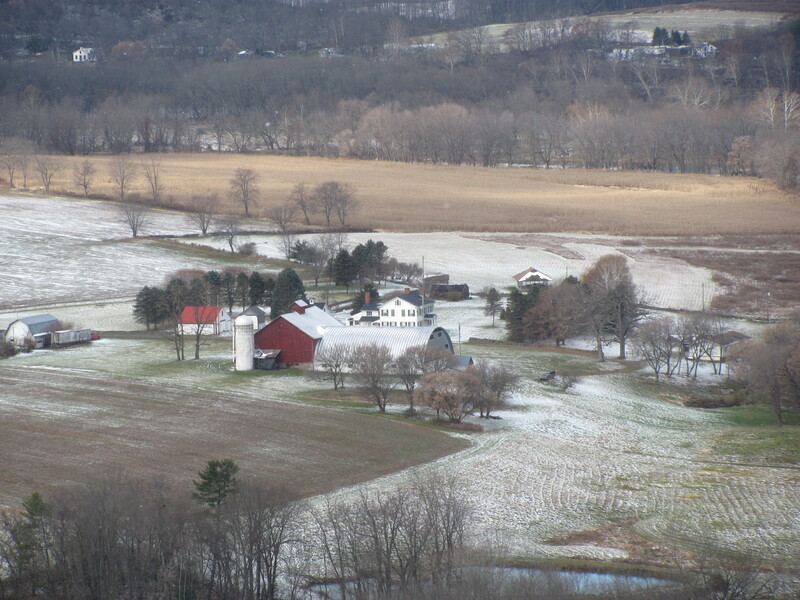 By noon on Tuesday, some of the snow that had fallen during the night had begun to evaporate, including from the fields in Terry and Wyalusing Townships in Bradford County. Last week, national and local weather forecasters threw a scare into those of us living along the spine of the Appalachians, with the prediction of a significant snowfall this week. It appeared inevitable as a strong Arctic air mass was poised to run into warm moisture riding up from the tropics right over the mountains of North Carolina. As is often the case, however, the forecasters abandoned their ballyhoo and, by the weekend, predictions of an early snowfall were forgotten. By Monday morning, a “slight chance of flurries – mostly in higher elevations” was added to the forecast for that evening. With temperatures still hovering in the 40s at nightfall, few people believed that anything frozen would come from the thickening clouds. After midnight, a band of rain, then sleet swept in from the northwest, setting the icy foundation for a slick morning commute as it bounced off bedroom windows, The seeming silence that followed lulled many back to sleep as the sleet changed to snow. By daybreak, one to three inches of dry, powdery snow blanket the landscape. Many schools were closed (or at least delayed) on Tuesday due to the black ice that lay underneath the crust of white, not because of any significant snow totals. 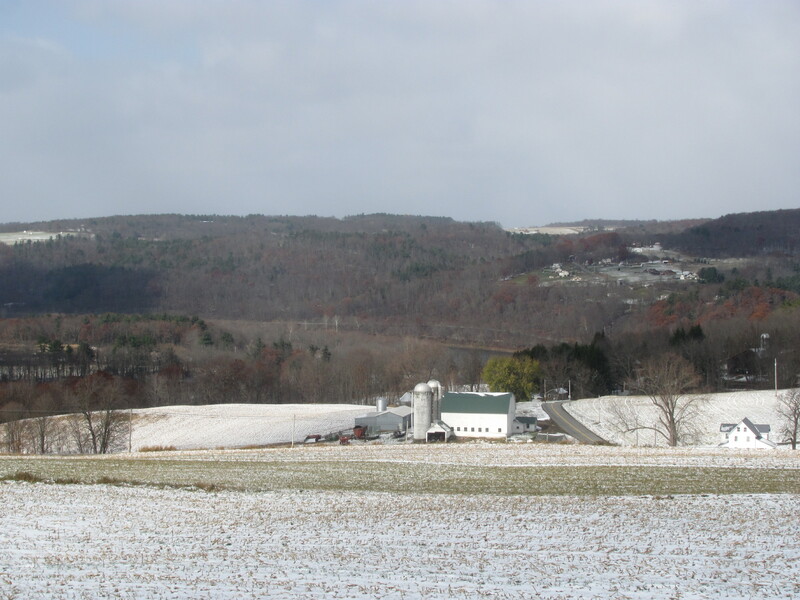 In much of the Endless Mountains, temperatures remained below freezing all day, as frigid north winds brought showers of lake-effect snow across the region. That snow which disappeared didn’t actually melt, it evaporated in the persistent winds that kept wind chill numbers in the teens all day. 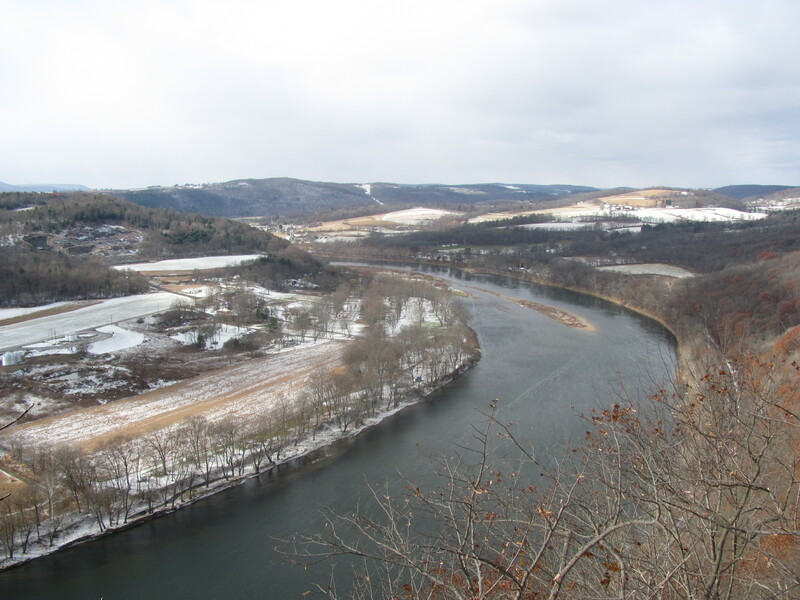 Looking northwest over the Susquehanna River from Meshopany Ridge in Wyoming County. Temperatures fell back into the 20s quickly at nightfall and descended into the upper teens by Wednesday morning, when many residents awoke to find that another dusting of snow had been deposited on walkways and vehicles. Temperatures today are expected to hover in the 30s with a bit more sunshine than yesterday. After a frosty start on Thursday morning, temps should peak in the mid 40s. Friday looks to be the first of at least four temperate days in a row with highs predicted to be in the more seasonal 50s. French Azilum Historic Site in Asylum Township, Bradford County.